*For months and months my cluttered office space has been hanging over my head. 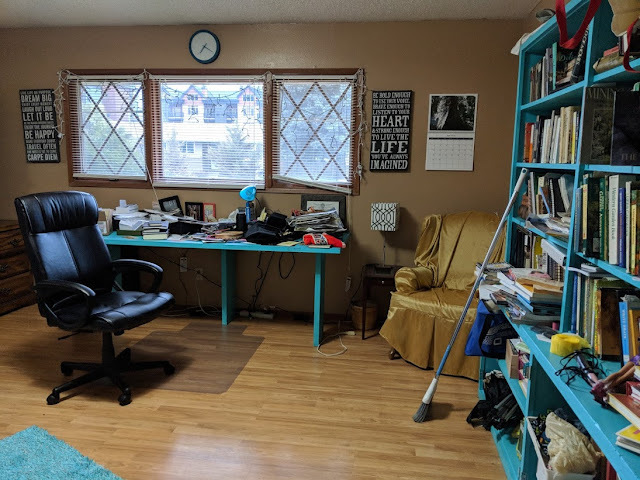 If I go to my office to look for something, I tell myself, “This would be a lot easier to find if this room was organized.” After the fourth or fifth time of this happening, I finally decided today was the day to clear the clutter. I took one of our long tables and set it up in the hallway, and brought everything out that was on the floor, futon and chairs, and started sorting them out. Some went in the garbage, some went to the basement, some was put away in the closet, and some will be donated or returned somewhere else. What a good feeling!! *I was elated to receive a message from a friend who ended up taking a trip she thought she was going to have to cancel. She needed some time to herself, and she did it. Talking time for ourselves is so important. We often need to get away, rest, relax, and get some perspective. And often we cannot get perspective in the midst of the storms of our lives. So always remember to take time for yourself, or you will be no good to anyone. *What was lost has now been found. A letter addressed to Zoe from the Caldwell Police Department arrived in the mail today. It said her wallet had been found and that she could claim it at the police station. On the one hand, this was very good news. On the other hand, she lost this wallet over four months ago. A neighbor said they found it in the bushes between her house and their house. She said some Dutch Bros. cards and one of her debit cards had been taken. But it looked like everything else was there. She had cancelled her debit cards right away after her wallet was lost, so there had been no activity on any card. The whole thing seems rather strange, but she did get it back. *Christy and Dawn picked me up around 4:30 p.m. to travel to Coeur d’Alene to join Michele, Christine and Carolyn and other P.E.O sisters gather together to get trained in the various aspects of our current office. Teresa, as one of the duties of being a state officer, helped organize this event. I didn’t think I was going to learn much new information, but I did, and I was very pleased with how the evening turned out. *Christy, Dawn and I had a nice visit on the way home, and my evening drink of Yerba Mate, cream and stevia hit the spot before going to bed.